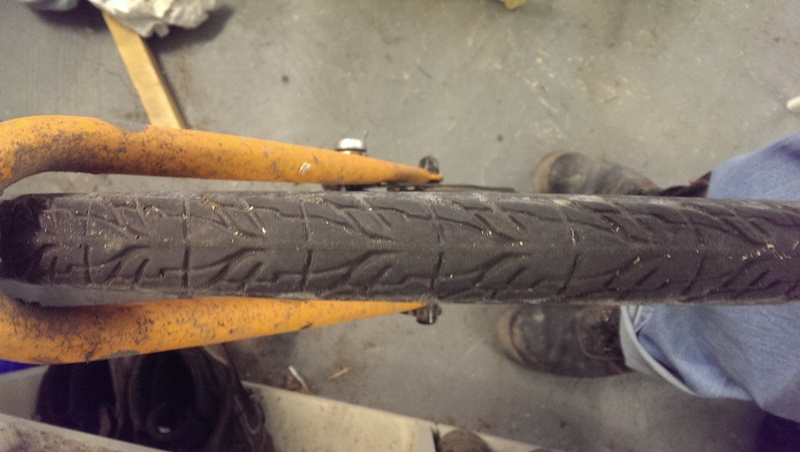 Solid cycle tyres have suffered a chequered past. Traditionally heavy, uncomfortable and lacking in grip, any mention of solid tyres would have anyone who has been cycling any length of time, laughing and ridiculing. And I did too. I’d ridden some awfully heavy and wood-like tyres in the 80’s, they were terrible things. So when Tannus popped up in modern times, I laughed again. But then the reviews started coming in. And they started sounding alright. Obviously no serious cyclist would be seen using them but for recreational cyclists who didn’t know how to change a tube, I guess they must have been ok. And then it seemed, people who ride a lot started trying them out, and liking them. This was all very interesting but obviously not enough to attract me, I’ve been cycling for over 40 years! Silly things. And then I had a week of punctures. My commute is 15 miles each way, some road, lots of gravel, some mud, some grass. The offroad paths through the town are particularly prone to glass and assorted debris left around by assorted ne’er-do-wells and I seemed to be picking it all up in my tyres. My stupid, hollow, puncture-liable, air-filled tyres. Each puncture adds at 5-10 minutes to the ride. Get 2 or 3 punctures on a ride and it started to add up, and sometimes I was getting 3 punctures on a ride. Eventually, I snapped. Arriving home with a bag full of tubes with holes in them and an evening filled with getting rid of the holes, I finally decided to try a Tannus tyre. Just one would halve the risk, right? So I figured I’d start with just a front tyre. Onto the website I go. There’s a bit of choice but I reckon I should just go as close to my existing tyres as I could so I look at the 700c 32 tyres, black, 100psi equivalent. (Now since I purchased mine, Tannus seem to have completely changed their marketing model. I could choose from a selection of psi references but these have now been replaced by names, some of which state psi, others don’t.) As far as I can tell, the new name for the tyres I purchased is Aither 1.0. Black Knight. So I buy one tyre from Tannus, it takes ages to arrive so I order another from a shop. Oh, be warned, the prices can be hard to bear at first. £50 each! Yes, that’s £50 for a bicycle tyre. Uhuh….. The tyres turn up one day after another. I’m still rather sceptical by the way which isn’t improved when I pull one of the tyres from the packaging and hold it. It’s certainly lighter than I anticipated but the rubber compound feels slippy and ROCK hard. I am dubious. I examine the fitting kit which consists of some pins to hold the tyre to the rim and a plastic lever to help get things on. Little did I realise just how difficult that process would be. I wait till the weekend to begin. I go for the front first.I take the old tyre and tube off and after reading the instructions, I also remove the rim tape (it can stop the tyre seating sometimes). I measure the rim width and choose the appropriate sized pins. I didn’t realise it but choosing 32mm wide tyres was one of my mistakes here. My rims are quite narrow on this bike and given my choice of wide tyre, fitting was going to be difficult. Um…yeahhh. Getting the tyre on the rim is interesting. The only way I could manage it was by using zipties to hold it in place where it was on and then using the lever to get it on a few more inches, ziptie that in place, continue. I quickly learned that two zipties were needed for confidence as I broke a few. The tyres fit very snuggly onto the rim, it almost appears impossible as you start and it takes an enormous amount of effort just to get the tyres on the rim. But that’s only the first step. Now I have to get the 40 or so pins clicked into the rim. This is a case of getting on side inside the rim then using the tool to force the other side to bend enough to pass the lip, again, an awful lot of effort required for each one. An hour later, the front tyre is on. The rear goes on faster as I’ve nailed the technique but it’s still a good half hour. So where are we now? 500 miles in both tyres, all commuting. They say 50 miles to break them in but I didn’t notice any difference. Can I still tell I’m riding solid tyres? Yep. They are very hard but I did buy the 100psi ones. Their firmness is more noticeable on rough ground. On smooth tarmac you wouldn’t know and it’s only really if you hit a pothole that you get a reminder of how solid they are. On the plus side I find I can just ride into stuff, especially offroad. It’s bumpy but no worries of a pinchflat. I’ve got used to them and I’m fine with the ride, however, see bad points below. Very hard, not very compliant. This is most noticeable when riding over hard ridges of mud/tarmac as I’m assuming normal tyres would mould to the ridge a little but these tyres simply don’t. This can make the bike try and find a way off the ridge quicker than normal which is disconcerting the first few times it happens. 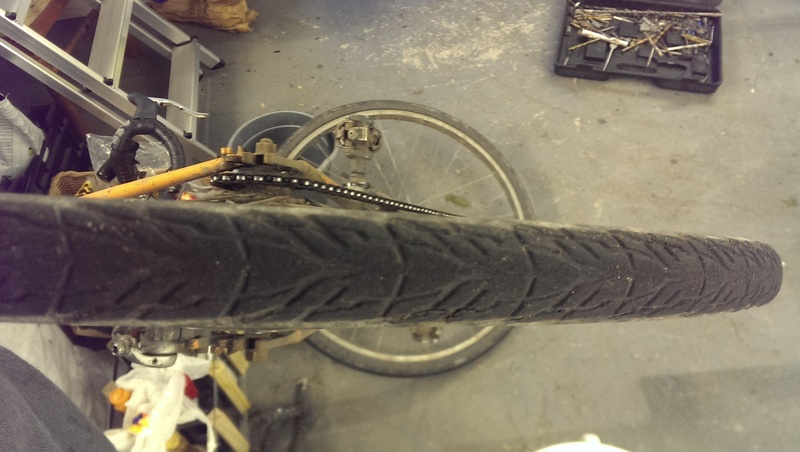 They’re not as grippy as normal tyres, most likely because they’re so hard but they have let go when I’ve pushed them into corners a bit too fast. The good thing is they’re very predictable when they do this and just slide rather than completely letting go. I’ve not dropped the bike on a corner with them fitted yet, something I’ve managed a number of times with normal tyres. Bastards to get on. Really. Expensive initially. Time will tell if they’re better value in the long run. Slower? I’m not sure. My average speed doesn’t seem to have changed according to Endomondo but they do feel slower. This could just be me thinking it’s so or maybe even me compensating when I’m riding and putting more effort in. It’s minimal if they are slower. Quite happy I bought them. Based on my average puncture count for commuting, they’ve saved me plenty of time and messing about already. They’re great for just charging across stuff like rough gravel or big rocks, no mincing required. The peace of mind is worth a huge amount, I know I won’t get to my bike in the work bike shed and find I’ve got to repair a puncture before setting off which is great. I save weigh and space on my back by not needing tubes, pump, levers and patches. They do have some small handling issues but nothing major and this is only commuting. If they last 5000 miles they’ll have saved me money in tyres, tubes and patching, more than that will be an absolute bonus. Time will tell. Would I buy them again? Definitely for commuting. I doubt I would for my road bike. If they last well I’ll certainly be buying them for my tourer.